Time was, every city had something special about it. A special, local blend of stores and products that made that city unique. It wasn’t Macy’s in every downtown and Budweiser in every tavern. 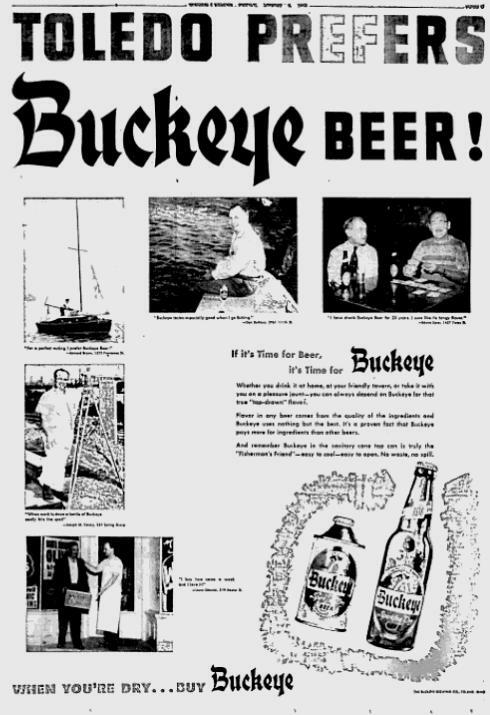 In Toledo, it was Buckeye Beer and Tiedtke’s. 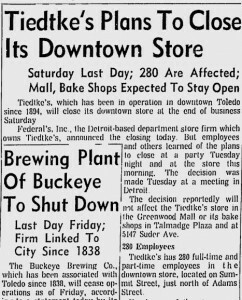 And on August 30, 1972, both those long-time Toledo names had big news: Tiedtke’s was closing its downtown store and Buckeye Beer was closing its local brewery. The two stories shared the local news cover in The Blade the next day and appeared on the front page on the day’s Blue Streak edition (a late run edition that had closing stock prices). It might not be too much of a stretch to say it was the day Toledo lost something it never got back. Suddenly, a lot of its local character was gone for good. I’m not sure how many people remember the original Buckeye Beer, however. I certainly do, though I was not old enough at the time to be drinking any (my dad was a Blatz guy anyway). The Buckeye Brewery, at 1501 Michigan St., was the second-oldest business in Toledo (the oldest business, then as now, being The Blade), dating to 1838 (a scant three years after the Toledo War). Buckeye survived Prohibition by bottling soft drinks, and was joined by two other local breweries after repeal, but by 1949 Buckeye was the only one standing. In 1966, Buckeye’s directors approved the sale to the Peter Hand Brewing Co. of Chicago, which was later renamed Meister Brau, Inc. In 1972, Miller Brewing Co. bought the trade names Buckeye, Meister Brau, and Lite. Towards the end, Buckeye was a small player in the beer business with its output of 300,000 barrels a year. After Toledo’s brewery closed, Buckeye Beer was brewed in Milwaukee – at least through 1974 – but not for very long. As a footnote, Meister Brau had a brand, Meister Brau Lite. If you note that Miller bought the trade name “Lite” above and put two and two together, you’ve already figured out that Miller Lite was the beer that sprung from that trade name (at least according to Wikipedia). The story noted that some of the employees had worked at the brewery since repeal, and while there was some confusion about the act, the handwriting had been on the wall for some time, according to an employee. But the names live on. In 2010, the Meister Brau trade name was bought up for $45,000. It’s not hard to find Buckeye Beer memorabilia on sites like eBay. Inky’s restaurant (N. Detroit and Sylvania avenues) still has its TIME FOR BUCKEYE BEER neon sign on the wall (as of July, 2012, anyway). 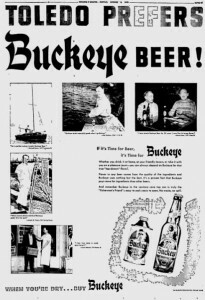 Meanwhile, the Buckeye Beer name was resurrected in 2000 and is now produced by the Maumee Bay Brewing Company, which operates at the Oliver House. The folks over at Beer Advocate give it a C+, but having had some, I can tell you it’s better than that. Tiedtke’s, at 408 Summit Street (at Adams) was a Toledo institution, in business downtown since 1894. 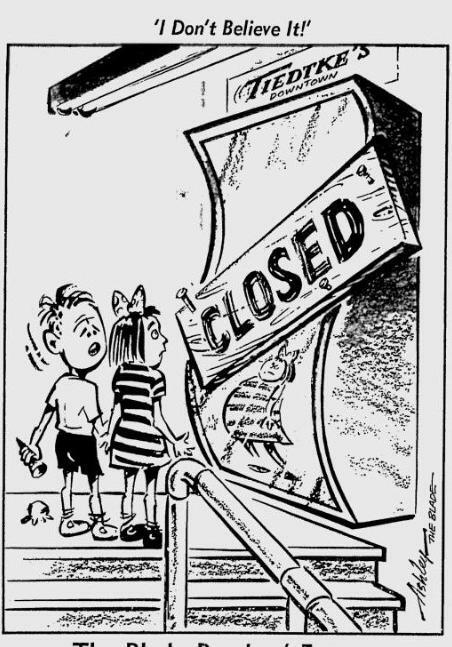 It was a big advertiser in The Blade (which they were undoubtedly sorry to lose) and there wasn’t anyplace like it in town. It had been family owned for many years but eventually was sold to a chain based out of Detroit, Federals, Inc., in 1961. Twin announcements Wednesday of the end of operations at both Buckeye Brewery and Tiedtke’s downtown store came, naturally, as unwelcome news. It is never a happy occasion when two venerable commercial establishments that have been such a part of the local scene since the last century are forced by circumstances to close down. …When the Kobacker family acquired the store in 1925, they wisely retained the distinctive character of the store – the flourishing grocery, produce, cheese, fish and meat departments; the bakery with its deserved reputation for fresh-baked, quality products; the coffee-grinding nook, the tobacco shop, and a dozen other activities that, through noise, color, aromas and bustle turned the first floor into a veritable shoppers’ circus. In addition, the Kobackers carried on and improved the special merchandising tactics – the giant cheese wheels, the annual buffalo meat sales, the performances by jugglers, the ubiquitous organ melodies and the like that added so much to the enjoyment and satisfaction of shopping at Tiedtke’s. 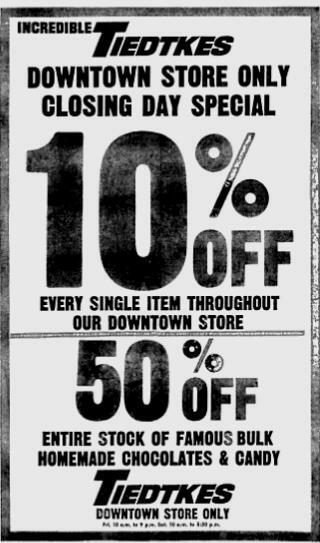 Tiedtke’s kept its Greenwood Mall store open, but according to clips, it closed in 1973. It was replaced by an Ontario’s and, in 1976, a Montgomery Ward’s. As a child in 1972, though, I can tell you I can’t remember much about Tiedtke’s. It’s still very well-remembered. The Tiedtke Old Timers still meet yearly (and here is a longer 2006 reunion story). I remember the store only vaguely and naturally the thing that sticks out in my mind are giant wheels of cheese, and of course, the May 7, 1975 fire that could be seen from every part of town. 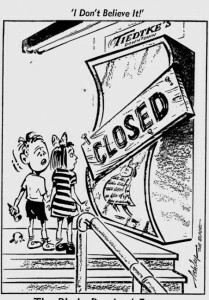 But by the time Tiedtke’s downtown closed, we didn’t do much shopping downtown anymore: there was Westgate and there was the new Franklin Park Mall. We rarely went. And that was part of the problem. My hobby is collecting old Toledo Brewery memorabilia, and would absolutely LOVE a copy of the picture!! I have a photo from 1954 Buckeye brewery cans. My brother got Christmas season jobs at Tiedke’s. And every winter he would cut chunks from this huge block of cheese on one of the upper floors, selling them to customers. I tell him he’s the only man I ever knew who actually go paid for “cutting cheese,” if you catch my drift. Oh there’s a place I wish was still there! It was a shame what they did to DeVeaux a few years back. Sadly I wasn’t even born when much of this was going on in the 70’s, but from what my mom had told me about Tiedtke’s, it certainly was a shame how it happened at all. She have had fond memories of going to that store as a small girl herself, telling me of the time she was caught shoplifting something from them, and after being so upset over what she did, she wrote a thank-you letter to the store thanking them for having caught her. I was born on May 7th 1966. That day in 1975 was when it burned down. I remember getting my Christmas Pictures there. As well as my two brothers and sister. I remember We went up on the elevator and check out the toy section. . I remember my Mom picking up boxes of Christmas Gifts in the stationwagon car. I remember the kids plastic wheels cars that we drove around until we wore out the wheels. When I talk to my Mom and my Aunt they just light up there face and tell me the stories, and the coffee and the cheese, food…..so cool. 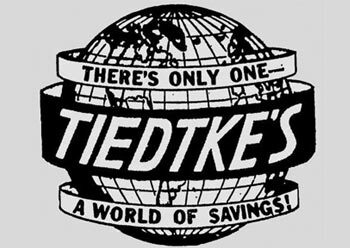 I worked at Tiedtke’s in Greenwood mall and when it closed, I remember some of the people who had worked there for years and lost all of their pensions! It was so sad!! One guy was ready to retire and had worked there since he was 16 and lost everything!!!! !